Let me start by making something clear: I want the poor to be exploited. That’s it. I’ve said it: exploit the poor. My biggest concern is that not enough employers in our economy exploit the poor. The result is that they do not work, do not earn an income, do not learn on the job, do not get promoted, do not buy houses, and do not send their children to school. All because they do not get exploited. Because over-regulation makes it impossible to exploit the poor. How can these poor people best make their way in the world? The best way for them to make their way in the economic world is to get jobs. Of course, we can say that they should first become educated, but for the time being we do not have that luxury. On the whole the unemployed are poorly educated, and in the mean time they have to eat. For the time being the fact is that our education system is in a mess, and that thousands of poorly educated workers are released on the marketplace on an annual basis. So how must these poorly equipped marginal workers find jobs? Let’s deal with this by way of an analogy. Let’s accept for the moment that chuck steak is regarded by the consumer as less desirable than fillet. Let’s say chuck steak sells for R50 a kilogram, whilst fillet sells for R150 a kilogram. For the chuck steak to be attractive enough so that available supplies can be bought up by consumers, the seller has to compensate by means of a lower price. If the supermarket or the butcher should insist that both kinds of meat should sell at R150 a kilogram, the chuck steak will not sell. In fact, to translate it into economic terms, it will remain “unemployed”. Now suppose legislation was passed which compelled supermarkets to sell chuck steak and fillet at the same price of R150 a kilogram, whilst market forces would dictate the prices of R50 and R150 respectively. The result would be predictable. The chuck steak would remain unemployed. Of course, a predictable objection to using such an analogy is that employees are not pieces of steak, and cannot be analysed as such. One may well ask: Is it fair that some individuals, through no fault of their own, have to work for a lower wage in order to become employed? It may arguably be unfair that that is so, but that does not change the facts. The facts are that if by law minimum wages and other terms and conditions of employment are imposed on employers who wish to employ marginal employees, those employees will either lose their jobs or never be employed in the first place. Like “chuck steak” the law then renders them unable to offer a compensating advantage for their lack of skills and experience. They are by law prohibited from offering their services at a lower rate to compensate for their less desirable employment qualities. In short, we are outlawing their employment. If, on the other hand the government should allow chuck steak to be sold at R50, or the employee to sell his labour at its natural market wage, both will sell to its maximum potential. Protecting workers against unfair dismissals or other unfair labour practices. Employers also need to fork out more money in order to pay workers represented by trade unions and workers on strike. The simple economic fact is that if employees have higher bargaining power, as they undoubtedly have where trade unions and strikes are protected by statute, employers end up paying more in order to secure the co-operation of their workforces. Finally, unfair dismissal legislation exacts a price not only for the otherwise productive hours spent by employers in disciplinary hearings and similar proceedings mandated by law, but also for legal expenses incurred in fighting disputes as well as compulsory retrenchment and similar packages. Many disputes end up in compensation awards payable by employers, also in the case of unfair labour practice and unfair discrimination disputes. The result is thus that the total package that employers have to fork out – whether by way of cash or lost productivity – increases pursuant to benefits to which employees are entitled as a matter of law. The cost argument can also be approached from the viewpoint of a future investor. Although a potential investor does not necessarily consider labour laws in his calculations whether or not to invest in the labour market of a country, he undoubtedly considers potential profitability. In doing so he projects the likely unit labour cost having regard to the market price of labour as influenced by labour law and other factors, as well as the demand for the product. If he concludes that there is insufficient demand to provide a satisfactory return on his investment, he will not invest. If the cost of labour as influenced by labour law is therefore such that he concludes that his investment is not worthwhile, he simply will not create any new jobs. What is the evidence: What impact does regulation have on employment? First, consider general economic legislation, as opposed to labour laws. Although general economic regulation may not be intended to impact on the labour market, it often has such unintended negative consequences for employment. Regulation of credit, labour and business markets. In the 2011 annual report of Economic Freedom of the World, for example, 152 countries are evaluated. Hong Kong, for a number of years running, has been the country with the highest score for economic freedom, namely 8,97 (out of a maximum of 10). Venezuela brings up the rear with 3.93. South Africa, has dropped from 41st place in the rankings in 2000 (when its score was 7.08 – its best performance since democracy) to 64th with a score of 6.8 in 2011. In other words, while South Africa’s absolute score has declined marginally, its relative ranking has slipped 23 places in a decade. That means that South Africa’s net relative competitive position compared to those of other countries, has declined. Because all countries compete in the same global market, what matters is the relative competitiveness of a society as much as its absolute score. 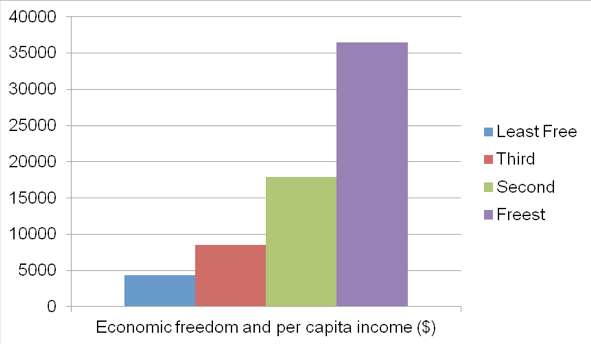 Countries with more economic freedom have substantially higher per capita incomes. 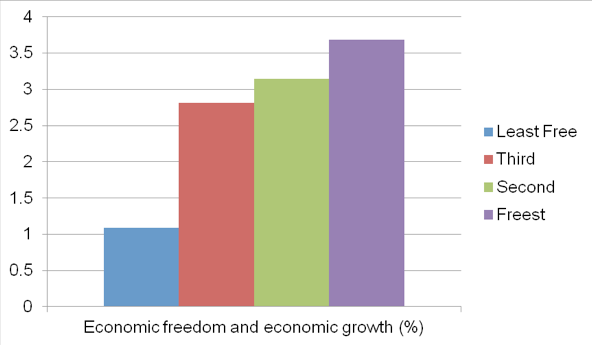 Countries with more economic freedom have higher growth rates. 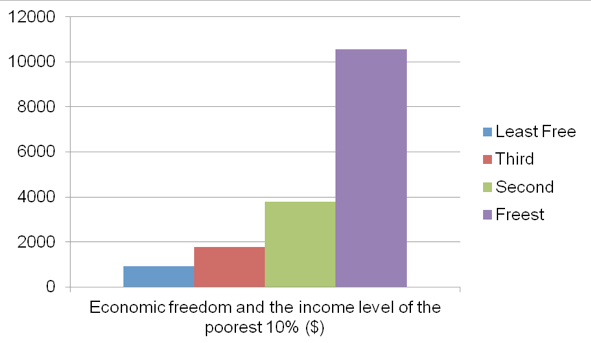 The share of income earned by the poorest 10% of the population is unrelated to the degree of economic freedom in a nation. 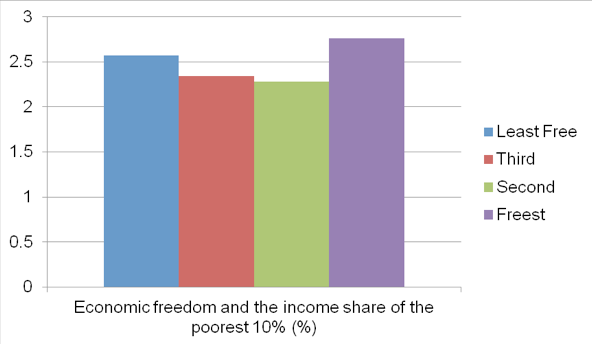 The amount per capita, as opposed to the share, of income going to the poorest 10% of the population is much greater in nations with the most economic freedom than it is in those with the least. 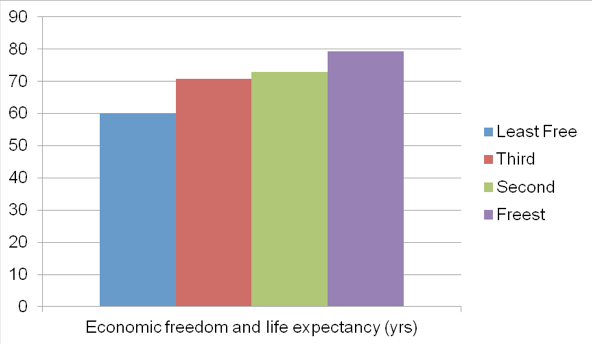 Life expectancy is over 20 years longer in countries with the most economic freedom than it is in those with the least. It is hard to argue with these statistics. It should be emphasised that the measure of economic freedom adopted by the authors does not imply anarchy or no regulation at all. However, where regulation is to improve the score of a country, it is invariably regulation that ensures good governance, effective court systems, protection of property and prevention of crime – ie regulation that protects economic freedom, rather than limit it. On the other hand, factors that tend to detract from the score are the size of the government, the level of taxes, an inflationary environment, interference with international trade, tariff barriers, interference in credit markets, labour market regulation generally, licensing, high start-up costs and price controls. Whereas the 2011 report does not contain any attempt at establishing a correlation between economic freedom and employment, it would not be surprising if such a correlation existed. What do the figures in fact show? 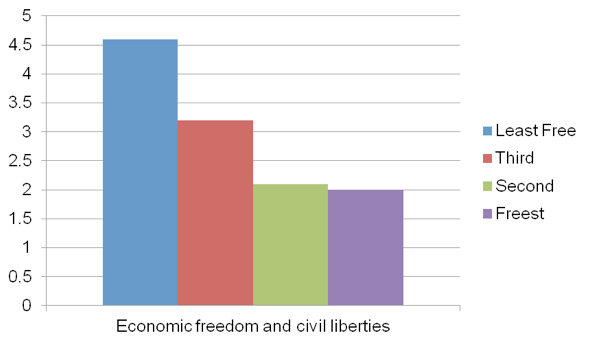 Countries with more economic freedom have lower unemployment. What is interesting about this result is that those countries that fall in the first quartile, namely the freest countries, perform significantly better than the other quartiles, whilst there is less difference between the remaining quartiles. The lesson from this is that it pays a country that is interested in job creation, as far as possible to put in place all the ingredients of market freedom, and not to neglect any. This will have an exponential or multiplier effect on employment creation. Does labour law itself have an influence on the likelihood of unemployment in an economy? The extent to which the relevant labour laws are actually enforced in practice. It is all very well having a plethora of black-letter regulations; but if the state does not have the will or the wherewithal to enforce them, they are next to meaningless. Allied to this is the factor of the size of the informal economy, especially that part of it comprised by illegal immigrants. To a large degree informal employees do not enjoy the benefits of labour law. As I show in a later article, of crucial importance is the demographic make-up of the country in question, notably whether it is homogenous or heterogonous in terms of ethnic, religious, linguistic and educational criteria. As appears from the earlier section on the effect of regulations on employment generally, the degree of freedom of the relevant economy – above and beyond labour law – is highly relevant.. So the challenge is to try and design a study that isolates the impact of labour laws, whilst excluding the other and similar factors as well as possible. One such a study is to one done by Timothy Besley and Robin Burgess entitled Can Labor Regulation Hinder Economic Performance? Evidence from India. of investment, employment, productivity and output in registered manufacturing. “Further results suggest that labor market freedom and a smaller state government, which are two components of overall economic freedom, are important determinants of employment growth across U.S. states, with the former factor the more important”. It follows that if South Africa is interested in improving its job creation record, it must seriously consider improving its general economic freedom score, and also in particular its labour market freedom score. Why are we still arguing? It is quite simple really. The law pushes up the cost of labour. So employers buy less of it. Why then do we keep on arguing about it? I have over the years encountered a number of dearly held myths, that explain why even those who are in good faith on pro-labour law side of the debate (whom I call the “pro-lawyers” for short), honestly believe they are right. It is necessary to deal with these. This a a serious myth, because most people really believe it. The most obvious reason why labour law protagonists so fervently support it, is because they really care, and believe employees without the protection of labour law will be exploited and standards will become progressively lower and lower as employers are left without any incentive to improve working conditions of employees. Often they ask in all good faith: Does deregulation not mean that increased job creation by removing expensive labour laws will breed a low-wage workforce whose conditions of employment will never improve? Does the government not have a point when it says that removing existing protections and minimum conditions will lead to a downward spiral of ever-worsening employment conditions? Or as it is sometimes put, “a race to the bottom”? This is one of the most persistent ideas amongst pro-lawyers, and one which is hard to shake. The perception, which is surprisingly common even amongst commentators who should know better, is an understandable and intuitive one: Surely, they reason, if you remove, say, minimum wages, employers will be free to pay lower and lower wages, and will continue doing so in order to remain competitive – not only with their local counterparts, but also with overseas competitors. This process will feed on itself, with the result that workers will get paid less and less over time. To understand why a so-called race to the bottom will not occur, it is important to bear in mind how the labour market works. At the risk of repetition, the labour market is a market like any other. As long as marginalised workers can charge market wages for their services (even if that is lower than minimum wages that the State would prescribe) employment will grow. It will do so because the economic law of supply and demand dictates that demand for a good or service rises if it becomes cheaper. At first workers will be employed at wages that are lower, most likely significantly lower, than the erstwhile prescribed minimum wages, and on conditions that probably give less protection to employees than what the law used to mandate. However, the labour market being a market like any other, as soon as employment increases because more employers are able to pay wages and accommodate conditions for and under which workers are prepared to work, the demand for workers will increase labour becomes scarce. As soon as that happens, workers’ bargaining power will increase, because their labour will become a more sought-after commodity. That will mean that they will in time be able to demand better working conditions and higher wages. Employers will have to meet these demands, or run the risk of losing the workers, and losing out to the competition. At the same time employers will be forced, by reason of increasing wages, to train workers and improve their productivity. Workers for their part will have the opportunity through on-the-job training to increase their bargaining strength and become more employable. All of these factors will thus inexorably push wages upwards. Vietnam maintained per capita income growth of more than 5% per year (in real terms), while achieving unemployment of under 3%. The UAE managed to improve the average income of workers by over 4% per year (again in real terms), and to limit unemployment to under 5%. In case of doubt about the ability of an African country to achieve such results, Uganda achieved per capita income growth of 2.5% against unemployment of 3.2%. Far from there being a race to the bottom, the opposite is likely to occur. Most significantly, GDP per capita in real terms increased from about $20000 to $30000. It is simply not true that deregulation is likely to lead to a plummeting of labour standards. Quite the contrary. Another reason for the inability of people like me and the pro-lawyers to see eye to eye has to do with a misconception about the nature of jobs, welfare and wealth. I call this myth the wage fallacy. It is the fallacy, put at its simplest, that believes that aggregate welfare of people in the economy will improve if we can manipulate wages and other employment terms in an upwards direction. It is related to the belief that money is wealth, which is the fallacious premise underlying all inflationary monetary policies. The fallacy is implicit in the government’s policy of maintaining a system of labour laws that is designed to improve the terms and conditions under which employees work – in other words, to make employment more, rather than less, expensive for employers. When it introduced minimum wages in the domestic workers sector some years ago, in its memorandum in support of the legislation it admitted that jobs would be lost as the result of the increases. But the job losses were justified on the basis that they would ensure a basic living wage for employees in the sector. (Read: people will become more wealthy). Of course, there was no suggestion as to what should happen to the employees who lost their jobs through this process, or worse, who were never employed in the first place. The government seemed to believe that the trade-off between higher wages and lower employment was justified in the circumstances. Enter the wage fallacy. Decreeing “decent work” is not a straight trade-off. It is not a case that some jobs are simply sacrificed for better working conditions. The workers who are put or kept out of jobs do not work, which means that they do not create wealth. Stop there for a moment. Ask yourself: Why do we work? We work in order to create wealth: To create houses, cars, transport, food, clothes, haircuts, entertainment, health services, education. Everything and anything that the market regards as valuable and is prepared to pay for. There is no other point to employment. Wealth creation is what enables the economy to grow, and more jobs to be created. The moment you decide to sacrifice some jobs for the sake of better working conditions, you must know that you do not merely sacrifice jobs. You sacrifice the wealth that those jobs would have created. Take the case of a furniture worker. If a furniture employer is forced to lay off workers, that means that those workers no longer make furniture that can be sold to members of the public. The reduced supply of furniture will push up the price of furniture. It can also happen that an employer, faced with mandatory wage increases, is forced to employ machines in order to do the work previously done by the employees. That is likely also to push up the price of furniture, because if the employer before the mandatory increase could have made furniture as cheaply using only machines, he would have done so in the first place. The bottom line is that unemployed workers are unproductive workers. That means that they are not able to contribute to the wealth of society, but instead become net consumers of benefits funded by the public purse – to which a smaller and smaller percentage of productive citizens contributes. The wage fallacy has another manifestation, which we can call the welfare fallacy. At the moment our government gives out more welfare grants than there are tax payers to fund it. That in a nutshell summarises the problem of our inability to conquer poverty. Recipients of welfare do nothing in return for the payments they receive. They create no wealth. Approximately 10% of the population pays the tax on which the vast majority survives. That vast majority do not help create the wealth on which the welfare of the nation should actually rest. The problem is not jobs first and foremost. It is lack of wealth creation. Poor people suffer because they do not create or have wealth – houses, food, transport, medical care. A job is not wealth. It is just a contractual deal whereby a person’s labour (his wealth-creation capacity, if you like) is engaged. But its economic purpose is to create wealth. That is why it matters if workers in the clothing industry are laid off, or their employers are closed down because they are not willing or able to pay minimum wages mandated by the bargaining councils. Those factories and workers effectively stop creating wealth in the shape of clothes. Thus a source of affordable clothes for poor people is closed down. The supply of clothes is reduced. The moment that happens, competition in the domestic clothes market is reduced, and consumers (most of whom are poor) are forced to buy more expensive clothes. Instead, by keeping those factories in business by allowing them to pay market-related wages, other manufacturers, and importers of Chinese clothes, would be forced to keep their prices low. By mandating “decent wages” for clothes workers, we thus undermine the creation of wealth by restricting the supply of cheap clothes to poor people. Agriculture is another example that makes the same point. Partly by reason of labour laws, the number of people working in agriculture has dropped dramatically over the last decade or so. The net result is that less South African produce in the form of meat, vegetables and grains comes onto the market, forcing South Africans to buy imported food at higher prices. Employment is part of the modern economy’s system of division of labour. We can notionally view our South African economy as a giant wealth-creation enterprise in which all the workers get a share of the wealth they make. But rather than reward workers in a food factory by giving them food, or those in a clothes factory clothes, it is more efficient to give them money that they can exchange for other forms of wealth. Viewed as a whole like this, it is clear that the economy will be wealthier, and so will its participants, the more workers work in it. We thus need a system under which more and more workers are employed, so that they can make a contribution to creating more wealth than would be the case if they stayed idle. Just stand back for a moment and consider this: In the current setup we have about 10 million workers earning mandated minimum wages in some form or fashion. Let’s suppose we could employ them, and the remaining 7 million unemployed workers, at market wages – that is, without the intervention of labour laws. Then 7 million more workers would all be creating wealth. Not only would that almost double the wealth creation – ie the GDP of the country – it would also give each of those 8 million a share of that wealth in the form of a wage. That will be infinitely better than artificially pushing up the wages of the 7 million who are in formal jobs. No significant increase in wealth creation will take place as the result of such a move. It is of course conceivable that an employer, in response to the increased costs imposed by law through labour laws, will feel compelled to, and succeed to, increase his labour productivity in order to meet the cost increases imposed by law. So, for argument’s sake, let us say a minimum wage law compels an employer to increase his monthly wage by 10%. The only practical way in which that employer can recoup the loss caused by such an increase, is by increasing his productivity. If the object of the exercise is to recoup the loss, the economic incentive of the employer will be to improve his productivity to the point where the loss is in fact recouped. In other words, it is unlikely, since there is no incentive to do so, that the employer will increase the labour productivity beyond that point. In other words, the employer will train his workers and equip them with technology that will enable them to justify the increase in cost imposed by the minimum wage law, and no more. The net result thereof will be that each worker will be, say, 10% more productive in order to recoup the increased cost of 10%. The employer’s output per worker will be more, but his unit labour cost will be the same. In other words, he will spend just as much as before on putting out a single unit of production. The problem is that he will now over-produce by ± 10%, all other things being equal. The reason for that is the enforced increase in productivity. It must be remembered that the employer produces for the same market as before, in which there is a limit to the demand of the consumers whom he serves. The demand for his products will be the same, and he will therefore have to retrench workers in order to maintain his output at the same level as before. Increases in productivity are good for the market, and in the long run create jobs – but then only if such increases in productivity lead to reductions in the unit labour cost – in other words if the employer can produce one unit of production more cheaply than before. If however the employer is compelled by law to recoup an increased cost imposed by law, the incentive is to improve productivity to the level that is necessary to recoup the imposed cost, and to get rid of workers. The pro-lawyers mistakenly believe that by improving the lot of employed workers by force of law, we will all be better off. And that causes them to believe that if we continue digging this vast hole that is unemployment, hoping against hope that if only we dig hard enough, one day we will get out. We will not. In similar vein to the “race to the bottom” myth, the argument is often made that the removal of protective labour law measures will lead to an exacerbation of South Africa’s problem of wage inequality. One of the possible benefits of such measures is, after all, is that they ensure greater social justice in the shape of greater equality of income, they reason. In other words: Although as the result of labour regulation we pay a price in terms of employment, at least we ensure greater equality of income, not so? But just think about that for a moment: In principle nobody earns less than the unemployed. 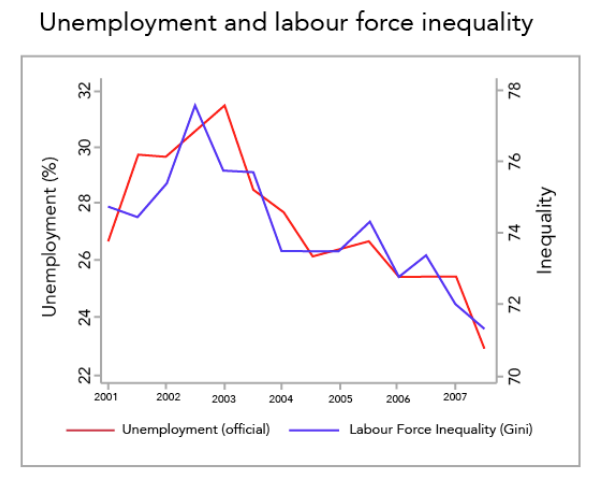 The more unemployed we have, the less will the bottom sections of the labour market earn. 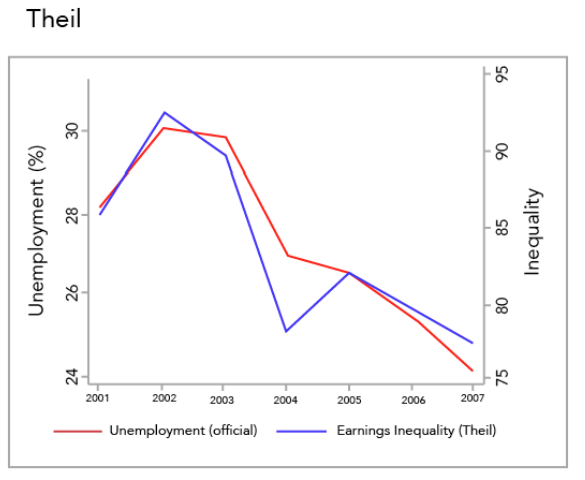 So it follows that the more unemployed we have, the greater the income gap. But at least enforced minimum wages and the like should have the effect of compressing wages amongst the employed? At least that will serve the object of social justice, will it not? First of all, a standard of social justice that measures only the equality of income those privileged enough to get jobs, is a doubtful notion of justice indeed. This immediately exposes the fallacy of this thinking. But more surprising is that this seemingly axiomatic conclusion is one “that just ain’t so”. 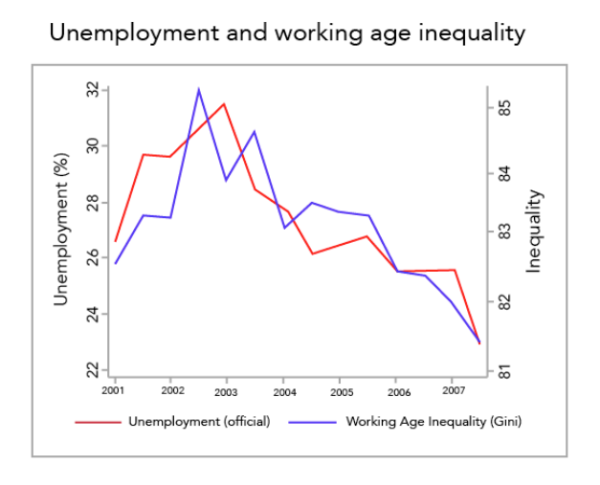 “Our empirical investigation points to the centrality of unemployment to the understanding of inequality in South Africa. The decomposition of overall income inequality by factor source showed that earnings from work account for most of total income, and the inequality in households’ receipt of earnings from work account for almost 80% of overall income inequality. We also observe a surprisingly close relationship between the trends in unemployment and in earnings inequality amongst the employed over time. 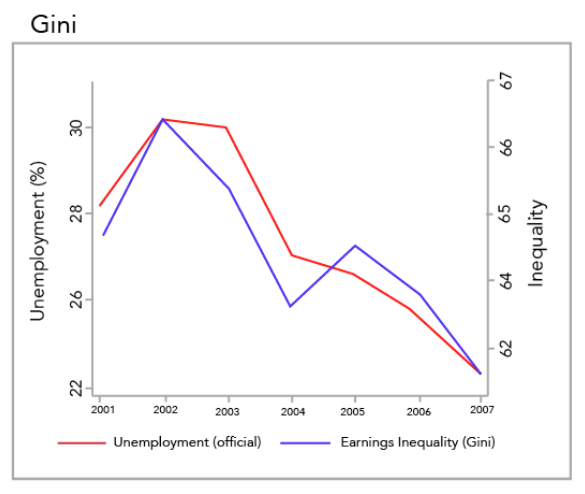 This is interesting in that it suggests that – at least for the period under review and within the ranges of inequality and unemployment during that period – there might not be a trade off between inequality and unemployment as the dominant international literature would expect … Furthermore addressing the crisis of unemployment is vital if South Africa’s extremely high levels of inequality are to be reduced ...” (emphasis added). Labour law is unlikely in South Africa ever to remove the problem of inequality of income. On the contrary, indications are that it is one of its major contributing causes. If we seriously want jobs to grow, we need to take the thicket of regulation – both general economic and labour regulation that hamper it – far more seriously.